Wooden Gift Box with Almonds – Perfectly Nuts! We are very excited about our newest product – a 1 pound wood collector box filled with your choice of amonds or sunflower seeds! Each wooden box is reusable with an engraved saying. 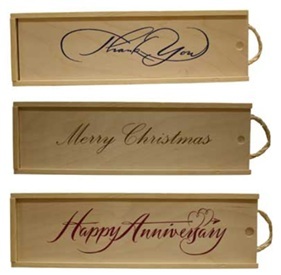 We have several to choose from and they make great gifts for anniversaries, weddings, graduations, Christmas and more! Also great for companies to give as employee or customer appreciation gifts. Each box fits a full pound of our cinnamon roasted almonds or sunflower seeds. Or you can mix it up and add a half pound of almonds and half pound of sunflower seeds. You may also try our cocoa roasted almonds, chocolate covered almonds or any of our other unique flavors. Either way this is a unique gift that will stand out and is sure to be remembered. The box measures 13.5″ x 3.5″ x 3.5″ with slide open lid and finger pull. Prices start at only $25.00 each and as always ask about custom options or quantity discounts on larger orders. Here are our standard wooden gift boxes which can be filled with either cinnamon roasted almonds or cinnamon roasted sunflower seeds. Next Just for Chocolate Lovers!